Aizawl, Dec 12 : No woman candidate was elected to the Mizoram Assembly even though it is the only State in India where women voters have outnumbered men, officials said here on Tuesday. There has been no woman legislator in Mizoram for the whole of the past two decades. In the November 25 Assembly elections, among the 142 candidates in the field, female aspirants were only six – nominated by various political parties. The results of the polls were declared on Monday. The Congress and the main Opposition Mizo National Front (MNF) fielded one woman candidate each, while three women contested on the Bharatiya Janata Party (BJP) ticket. One woman joined the fray as an Independent candidate. Tlangthanmawii, who is also the State Congress women wing president, and Lalmalsawmi of the MNF, were defeated by male candidates of rival political parties. The BJP’s three female candidates got very few votes, while the lone female Independent aspirant B Sangkhumi, former president of the Mizo Hmeichhe Insuihkhawm Pawl (MHIP) or Mizo women federation, also suffered defeat. “No woman was elected to the State Assembly this time,” Mizoram Chief Electoral Officer Ashwini Kumar said. “The Congress and MNF’s female nominees were fielded against heavy weight candidates while the other parties who fielded female candidates have little political base in the State. Therefore, no women could get elected to the State Assembly,” the CEO said. 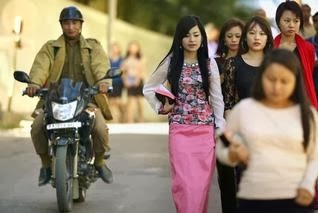 Mizoram is the only State in India where in a total population of 1,091,014, female voters outnumbered men by 9,806 in the total electorate of 690,860. Since Mizoram became a Union Territory in 1973 and a full-fledged State in 1987, there have been only three female legislators – Thanmawii (1978), K Thansiamii (1979) and Lalhimpuii Hmar (1987). Among them, Lalhimpuii Hmar of the MNF was a Minister in the government led by the late Laldenga in 1987. The Women Welfare Front, constituted by woman members of village councils across the State, has been actively spearheading the campaign for female candidates before the Assembly polls. “We made all-out efforts so that we see as many female candidates as possible in the November 25 Assembly elections. We requested political parties to nominate as many women candidates as possible. We made appeal to the female voters to vote for the women contestants,” Women Welfare Front secretary Darhmingthangi said. “As much as we need women in our domestic affairs, we need them in the legislative system too,” she added. “The Mizo society in pre-modern times was based on what is known as an extreme patriarchal society. This created ‘private’ and ‘public’ domain, where women were confined to the private sphere that further relegated their status in the social and religious life,” sociologist Subhankar Goswami said.